Professor Pig’s Magic Math is all about thinking like a mathematician. People who are good at math don’t just memorize facts! They understand numbers and they see number patterns everywhere. Professor Pig begins by teaching his students the “magic numbers”: the numbers that add up to 10. Using these five facts as a base, student are taught to see patterns that will allow them to easily add facts like 8+3 and 7+5, without any memorization. Stacks of many numbers are easily added using these number patterns. Professor Pig uses oodles of games and activities to review and practice. No boring worksheets! When there is a worksheet, specific instructions are given as how to attack it. 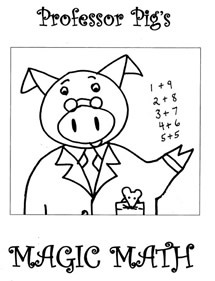 If your student balks at traditional workbooks, I highly recommend trying Professor Pig’s Magic Math. The chapters are posted as individual downloads because some people’s computers have trouble downloading them all at once.